I don’t know about you, but I have been amazed how much balance bikes have increased in popularity just in the past few years. My daughter got a balance bike when she was 2.5 years old. My son was 6 months old at the time she got it. By age 3, she had finally mastered the balance bike and was zooming past my husband and I on our family walks. Since my little boy grew up seeing his big sister ride, he was a complete natural at it! It literally took 10 minutes to figure it out the first time he hopped on, he had just turned 2 at the time. He had been riding his sisters pink balance bike, (he broke his previous bike that was made of wood, because he was so rough with it) and I really wanted him to have his own again. But not just any balance bike. I wanted it to be durable, and not wooden. Wood weathers so quickly, and with my boys roughness, it only lasted a year before it snapped. 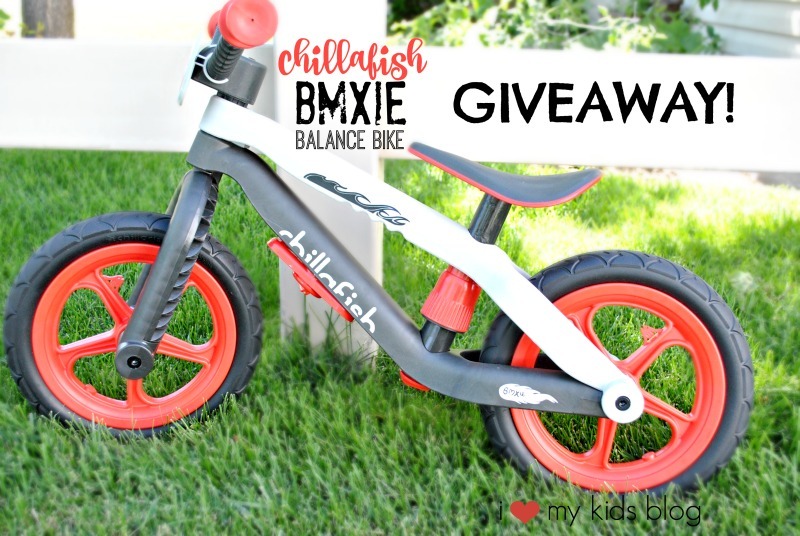 BMXie-RS Balance Bike from Chillafish! Completely durable with an AWESOME feature that you will have to continue to read about. First let me tell you that I fell in love with this balance bike right when I opened it up! The assembly of the bike was so simple! It took less than 5 minutes. It only had a few parts to put together and not many loose screws and bolts to put together. That’s right! Airless. Everyone’s dream tire for a bike. The unique tires are made from foam, but the key is that the tires for the BMXie-RS have the outer rubber tire layer. This is fantastic for little children because they ride their bikes without a care in the world. I am pretty sure my 2.5 year old boy would ride his bike through a pile of thumb tacks if I let him! 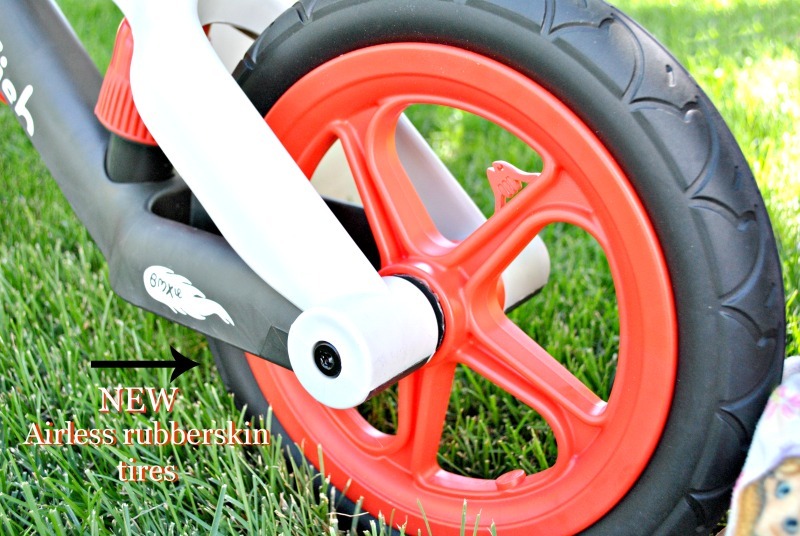 The airless tire feature is a huge added bonus to the BMXie balance bike! Don’t worry about tires going flat. 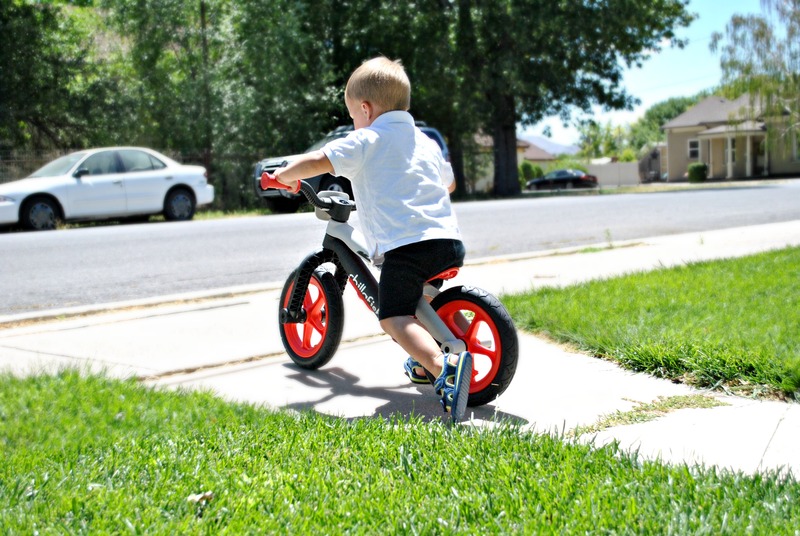 Let your little one ride their balance bike with ease and no stress for you! This is perfect for my little man, since he is so rough with his bikes. He literally throws his bikes. I don’t know why. It’s a problem he has. When he throws his BMXie bike the tires bounce. It’s pretty cool. The tires have a great grip on them as well. And isn’t the little fish in the tire adorable? It makes me like the bike even more. My son loves to ride his bike in the house. The bike is pretty light weight, which makes it easy for him to take his bike in and out of the house by himself. He always feels accomplished when he does things by himself. We go on family walks in the evenings a lot. My kids usually ride their bikes and there is a 99% chance that they will want to walk for part the walk. So thankfully, the lightweight bike makes it easy for us as parents to carry. An added bonus is the jagged edge underneath the seat. (See picture below) They fit my fingers perfectly making the bike even easier to hold. 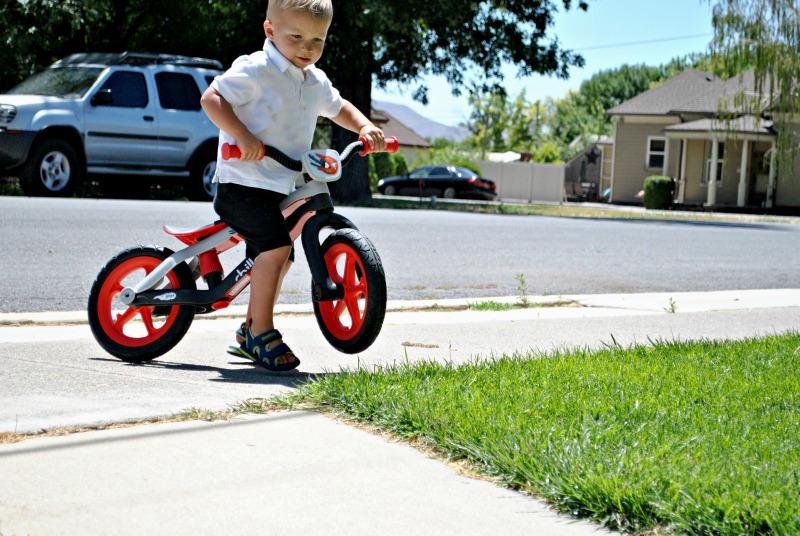 I am not sure if that was the intent of the bike, but as a parent this is a great feature. 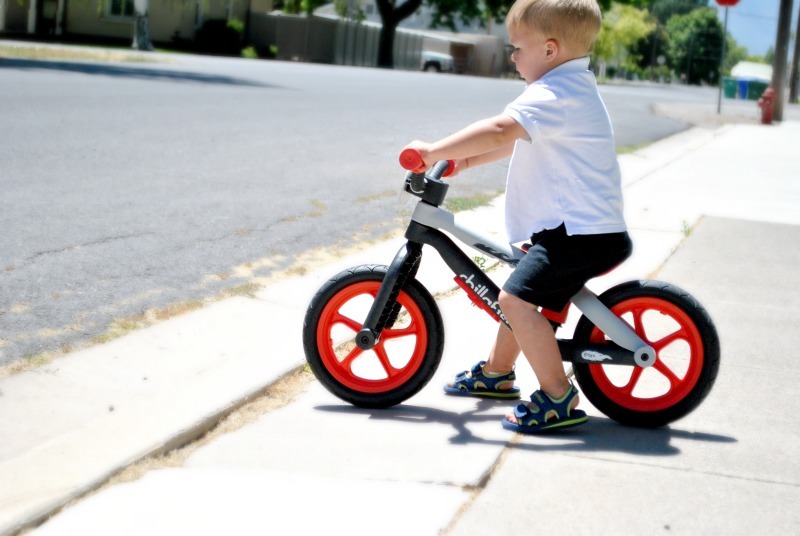 The bike also has an optional footrest for your little ones feet if they’re really good a balancing. My son isn’t quite there as yet, but maybe he will be someday. The feature is great as well. 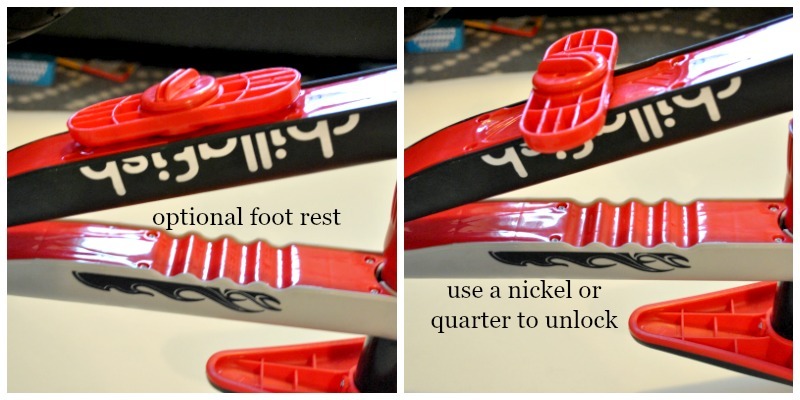 To unlock the footrest, simply get a nickel or quarter, and twist left to unlock the little button. To tighten it back up twist right. Easy. See the above picture for what it looks like. The Chillafish bike also has the choice of 3 different seat adjustments. Find the adjustment that fits your child perfectly. Adjusting the seat is easy as well! Again, take a coin of some sort, twist left to unlock and right to lock it back up. Then below the place where you put the coin, (if it’s upside down, I found it easier to put the bike upside down rather than keeping it upright) there is a bigger knob type of thing. Again, twist left to unlock it, right to lock it. This piece works like a screw. Once you’ve unscrewed the knob like piece, you can then adjust the bike to one the the 3 heights. make sure to twist it right to lock it back up or the seat will keep coming down. 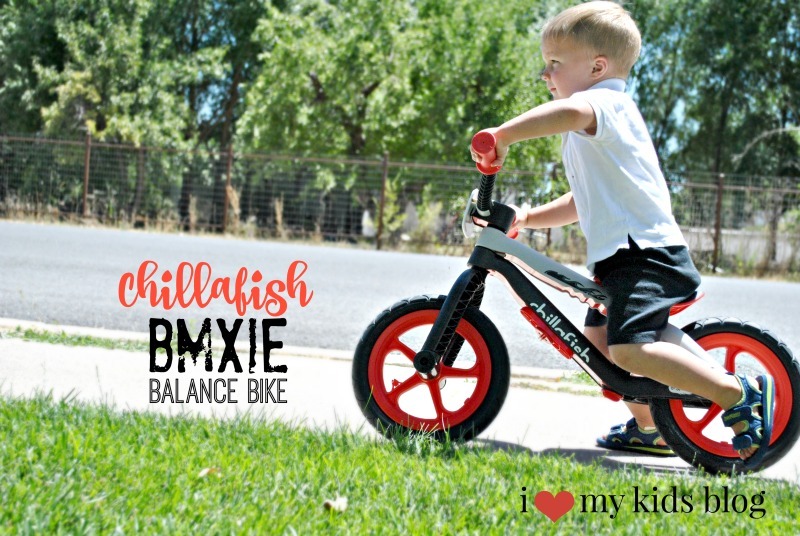 The Chillafish BMXie-RS is a balance bike that my sons loves and will have for quite a while because of it’s durability. We are so glad we have this bike. The bike does have a age recommendation for ages 2-5. Now that you know all about Chillafish and their new BMXie-RS balance bike, you may want to know how to get one!? Well there are two ways! You can always just go to Chillafish’s website and purchase one for yourself. Chillafish has dealers all around the world, so see if your area has a dealer to buy one. Or you can enter into the Chillafish BMXie-RS GIVEAWAY!! This isn’t just a “normal” giveaway. Chillafish is giving away a bike each day in August! There are 31 days in August in case you didn’t know. 31 bikes. 31 guys. No joke! You have 31 chances to win one of these awesome bikes!! To enter the giveaway, please click this link and answer the question. Be sure to read my review so you get the question right! So you better go enter. You enter ONE time. Hurry quick, you have 31 days to enter starting August 1st! 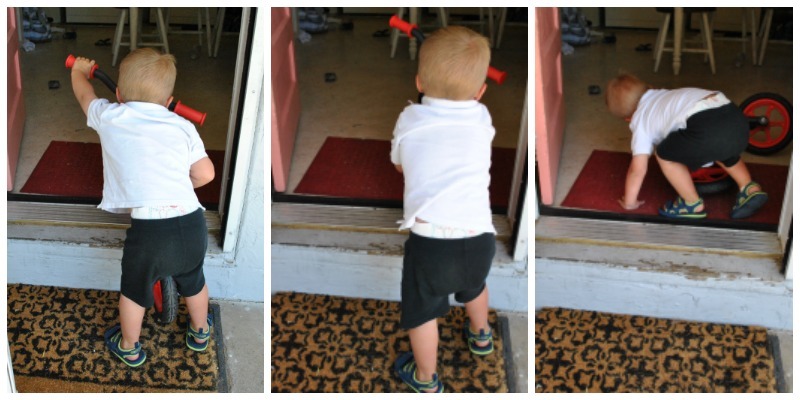 « 8 Back To School Tips To Eliminate The Morning Stress! Thanks for the heads up! Those are super cool bikes!